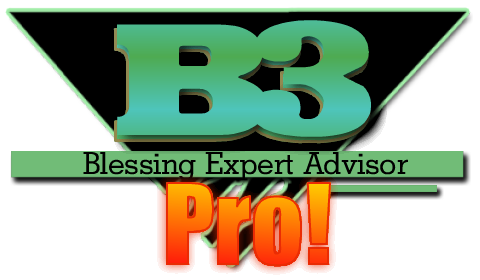 Blessing 3 Professional - B3Pro! - Blessing Pro! Our Professional, Proprietary and Wicked Expert Advisor! The Internet's Best Free Expert Advisor - in Professional Strength! Blessing Pro! can run on any chart and timeframe, and uses Trade Tracking with a unique Magic Number and Trade Comment to identify trades with your broker. The portion of the Account Balance used by each chart to trade Blessing Pro! can be set using Portion Control. To help you keep track of all the charts running Blessing Pro!, and the open trades on those charts, another EA is provided, called JTA Dashboard. But Blessing Pro! is not only about making profits, it is also about protecting your account balance when things do not go according to plan, by using Equity Protection. This is achieved by using Portion Control, Maximum Drawdown Limits and power out stop losses. There are several methods you can use to specify Trading Times, including a Daily Time filter,Holiday Shut Down times, and ShutDown after basket close. Blessing Pro! can also provide you with Information, through the use of the Display Overlay,Email, Sounds, Debug feedback, and Account Balance and Equity statistics. Common functions have been move to the JTA_Functions v1.6 file. UseStealth parameter added to give the user the option to hide pending orders, TP and SL points from the broker. Currency Conversion added for different Account currencies. Trade Times filter added, with the option to optimize trade times. Low Balance to lot size warning added if MM is in use - lot size calculation will show in Red if portion is below $1,000 and Orange if below $2,500. Links to the JTA Dashboard v1.1. Buttons for ECA, BUY, SELL, SD, Reset. Buttons to hide/show Buttons, Overlay, Trades, Entry, Debug information. Added MaxSpread for both opening and closing trades (MaxSpreadOpen, MaxSpreadClose). Set to 0 to turn either one off. The MM lot size calculation can be based on the portion equity rather than the portion balance - set BaseMMOnEquity to true. Further basket trades can be set to open only when the original entry conditions are met if BasedOnEntry is set to true. Trades can be stopped from opening if the account margin will drop below the percentage set in MinMarginLevel. New baskets can be stopped from opening if any BP chart, or any JTA chart (either or both) goes above a set Maximum DD (controlled through the Dashboard, which is where you'll find the settings). New baskets can be stopped from opening if the maximum number of allowed charts is already open - limits can apply to both BP charts and/or JTA charts (again controlled through the Dashboard). MaximizeProfit uses the new trailing stop, with TSLStartAt, and also uses a cosine function to control the rate of decrease in TSLPips if the reducing option is used. The reducing trailing stop is reduced over the pip distance set with TSLMaxMinDist. The lot multiplier is now totally user defined. There's also an option to optimize up to 5 levels of lot sizes. Added BasketDelayTime to delay the opening of a new basket after the close of the previous one. Added MAMaxDist, so when using the MA for entry a trade will not open if the PA is above/below the MA plus/minus MAMaxDist. Added option to optimize trading times. When using the time filter you can select whether the EA is allowed to open basket trades or not with the AllowBasketTrades parameter. Added an option to close the basket if MaxTrades are open and another level is triggered, with CloseAtMaxTrades. Added an option to automatically shut down over the Easter holidays. Added overlay info for when the next basket/level will open. All Entry methods now have a TF setting so different timeframes can be used (except CCI which already uses 4 TFs). Added Button if AllowTrades is set to false so that it can be set to true and start trading without opening the parameters again with the risk of something strange happening on the first few ticks. PendingTrailPA will allow the pending trades for a new basket to trail the PA as it moves in the wrong direction. Option for the Stoch entry to trigger a trade when the main line is leaving the zone instead of entering it. Auto Update feature will download the update file for you.